Trade winds are growing more turbulent, adding uncertainty to the business plans of dairy farmers as they weather a wave of consolidation that’s closing more than four U.S. dairies every day, according to U.S. Department of Agriculture data. At the National Milk Producers Federation (NMPF), where I am president and CEO, we see and hear the pain of these farmers. They need to access more global markets for their milk to be exported in the form of dairy products and ingredients. The quality of U.S. dairy products is world-class. At the prestigious 2018 World Cheese Awards in Norway, U.S. cheeses won 89 medals, more than France and Italy. It surprises some to learn that in 2018 the United States was the world’s largest cheese exporter. To continue to compete and win overseas, we need a level playing field through free-trade agreements. Working closely with the U.S. Dairy Export Council, we see more than the usual uncertainty on trade these days. Chinese and U.S. negotiators are grappling with how to reset the world’s biggest bilateral trading relationship, with hopes of an agreement later this month. The U.S.-Mexico-Canada Agreement, the signature U.S. trade achievement of 2018, has yet to be ratified by Congress. The U.S. Section 301 and 232 tariffs that have invited retaliation against dairy from crucial trade partners—China and Mexico, respectively—remain in place, with no clear way out yet. The importance of international trade to the U.S. dairy economy is almost impossible to overstate. 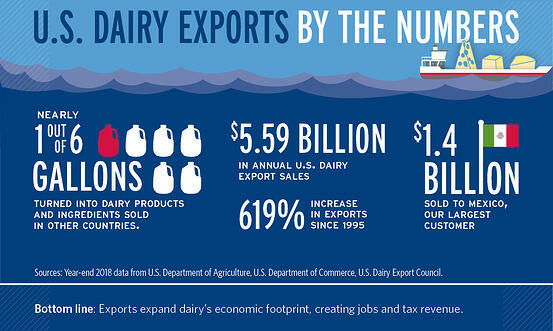 Dairy exports support nearly 100,000 jobs and generate another $15 billion in economic output, according to data on the #GotDairyJobs portal. About one-half of all increased dairy production since 2003 has been soaked up by exports. Last year, despite trade actions that crimped sales to China and Mexico, a record 15.8 percent of U.S. milk production went abroad—a percentage that will need to increase out of necessity as dairy farmers become only more productive. Each trade policy discussion is crucial for dairy, which is ever-more-dependent on global markets to support prices as U.S. production rises to meet global demand growth. Over the past 15 years one-half of U.S. production growth has gone to exports, and the percentage of the U.S. milk supply sent abroad has steadily increased. The outcome of each trade policy debate, in turn, will shape the direction of other negotiations important to the sector, including potential bilateral talks with Japan, the European Union, and the post-Brexit U.K., and potential negotiations with the Philippines and Vietnam. In our advocacy at NMPF and the work we support with the U.S. Dairy Export Council, we advance dairy’s interests at all times. When it comes to improving market access, dairy is in it for the long haul, and we will settle for nothing less than the best possible trade terms for our producers. One example of these principles in action is how we are calling for the immediate approval of USMCA as well as demanding that negotiations on Section 232 tariffs conclude and retaliatory tariffs are lifted. Our job is to support USDEC and to ensure that the U.S. government and Congress pursue policies that benefit producers. To ensure prosperous dairy trade over the long term, an overarching need is for agriculture in the current environment to be excluded from trade disputes that may or may not be justified. Because agriculture is a rare part of the U.S. economy with a trade surplus, it’s a tempting target for trade partners looking to retaliate against actions against them—and that’s a recipe to make our industry collateral damage in any trade war. While trade agreements that may be past their prime can be legitimately ripe for renegotiation, we then need to strengthen and renew those ties, not limit them in ways that harm U.S. dairy producers. We also need to negotiate and pass new trade agreements. The U.S. last successfully completed trade treaties in 2012, when agreements with Panama, Colombia and South Korea came into force. Meanwhile, competitors continue to conclude new agreements. The Trans-Pacific Partnership sailed without the U.S. last year, as the Comprehensive and Progressive Agreement for Trans-Pacific Partnership completed its journey. And the EU jumps from accord to accord, most recently with Japan. We need to ensure that negotiators focus on key sectors important to agriculture and not accept any drive for freer trade that puts farmers in the back seat. That’s why NMPF and USDEC support breaking down trade barriers as a matter of principle, but we can’t simply allow the EU to get away with preserving a status quo that unfairly protects its farmers and hampers U.S. agricultural competitiveness, especially irritants such as the EU’s use of geographical indications to pursue protectionist policies, when it insists on excluding agriculture from any U.S. trade talks. We want trade deals – but not simply for the sake of having them. We will always represent our dairy farmers and processors. We told the U.S. Trade Representative’s office of the importance of including agriculture in any EU negotiations and pointed out a study by USDEC outlining a potential loss of $20 billion farm revenue should the EU view of geographical indications take hold. USDEC studied how a changed competitive position in Japan could lead to more than $5 billion in losses, as the U.S. may lose market share as other nations implement trade agreements while the U.S. stands still. We met with officials in the United Kingdom to discuss what post-Brexit dairy trade could look like—and of course, we are no strangers in talking to counterparts in Mexico, Canada and China. These efforts take time and energy, with payoffs that are years in the making—and are absolutely critical for our industry’s future. Such patience is vital as trade developments twist, turn, and frustrate. The fact is, dairy needs greater market access. Increased dairy shipments abroad are the central reason behind the USDA’s forecast for a mild milk-price recovery forecast in its Agriculture Outlook forecast made in February. Greater access would provide an even greater recovery, one that’s hampered so long as tariffs continue to bite. When dairy’s prosperity returns, exports will be a big reason behind it. But easing the path for exports must be done right. That’s what we will stand for, and will always stand for, no matter how much the momentary shifts in trade winds may try to blow us off that path. 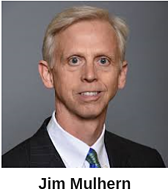 Jim Mulhern is the President and CEO of the National Milk Producers Federation. A version of this article first appeared in NMPF’s CEO Corner column. Trade Policy Free trade agreements Got Jobs?